Earlier this month, Education Lab asked readers to send us their questions about nontraditional students — a catchall for students who don’t speak English at home, recent immigrants and refugees, homeless students, gifted learners, students with disabilities, students who have interacted with the justice system and much, much more. Basically, we wanted to know what you want to know about the square pegs in the round hole of a school system that seems to be set up to elevate students from more traditional white and middle-class households. But one of the first questions we received wasn’t actually a question. Coincidentally, Allen’s prompt arrived just a few days before Seattle Times reporter Marcus Harrison Green explored exactly why some black families, swearing off both public and private schools in Seattle, have chosen to home-school their children. “It just didn’t make sense to continue to subject my kids to a public school system that devalued them,” mother Yasmin Ravard-Andresen said of her decision. Her family is part of a nationwide trend as more families of colors choose home school. Across the U.S., the number of home-schoolers reached 1.69 million as of 2016, the most recent year of data available from the National Center for Education Statistics. The number of white home-schoolers grew about 56% between 1999 and 2016, while the number of black home-schoolers grew a bit faster at 57%. What about Hispanic students? Their participation in home school soared nearly 500% since 1999. 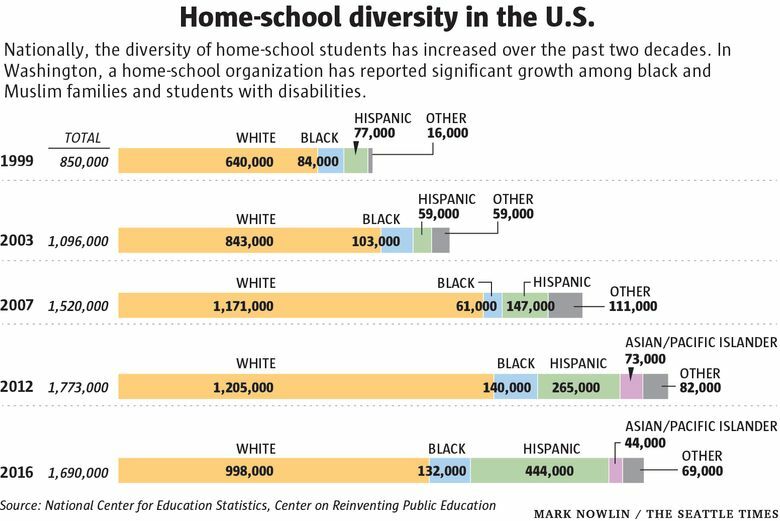 The count of home-schoolers identifying as an “other” race climbed more than 300%. “Once seen as the exclusive domain of right-wing Christian families, the group of families who are choosing to opt out of traditional public schools is growing more diverse,” Hirsh wrote in his draft report. Hirsh added that families of color aren’t alone. “Though no data is available, preliminary research suggests that students who identify as LGBTQ are taking advantage of home schooling as an opportunity to escape the bullying, peer pressure and shaming that are endemic to many public schools,” he wrote. The same is true for some Muslim families in the Evergreen State, according to Jen Garrison Stuber, advocacy chair for the Washington Homeschool Organization. She said her group has noticed a growth in home school among three specific communities in Washington: Black families, families of students with disabilities and Muslim families. Stuber said many parents in the latter group, regardless of race, have pulled their children out of public schools to avoid bullying and harassment. In 2017, a survey from the Institute for Social Policy and Understanding found more than two in five Muslims with children in K-12 schools reported that their children were bullied because of their faith. Kathy Dameron, a home-school mom of two, has heard similar reports from other Muslim parents who joined a home school co-op that she established near Tacoma last year. “I often get calls from parents saying, you know, there’s a boy in their daughter’s class who always has one nasty comment to say about her, or someone pulls her hijab every day, and that they hate going to school,” Dameron said. Her youngest daughter, now in the fourth grade, was an early reader and didn’t get much support when the family tried private school. So, backed with research, Dameron persuaded her husband to home school their daughter. She has since continued to home school a younger sibling, and both speak and write Arabic — something neither Dameron nor her husband can do.